Marsha Stephanie Blake and Jonathan Cake. Photo by Jim Cox. Brian Kulick, Artistic Director of Classic Stage Company and a leading Shakespearean expert, will direct the “Scottish Play” for The Old Globe in San Diego, which runs June 19 – July 24 in the Globe’s outdoor Lowell Davies Festival Theatre. Tempted by an evil prophecy and encouraged by his wife ever deeper into his own dark ambition, Macbeth murders his way to the throne of Scotland. Shakespeare’s chilling tragedy is filled with ferocious battles, supernatural horrors, famously gorgeous poetry, and some of the Bard’s most vivid characters. A stellar cast, under Kulick’s directions, will electrify the San Diego night in Shakespeare’s classic masterpiece. 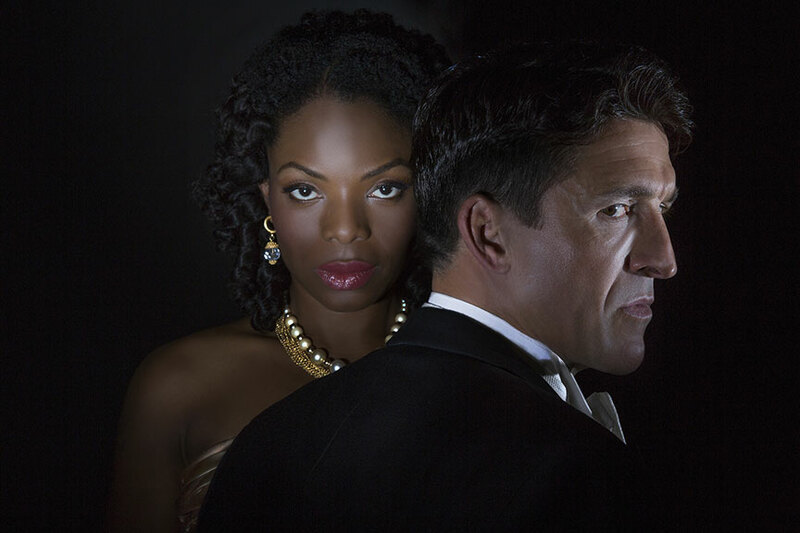 In the title role is Jonathan Cake (Cymbeline, Medea, and The Philanthropist on Broadway) with Marsha Stephanie Blake (Orange is the New Black, Broadway’s The Merchant of Venice) as Lady Macbeth. The cast also includes Jerome Preston Bates as Duncan; Clifton Duncan as Macduff; Brian Keane as Ross and 3rd Murderer; John Lavelle as Porter and 1st Murderer; James Joseph O’Neil as Lennox, 2nd Murderer, and Seyton; Mark Pinter as Old Man and Siward; and Timothy D. Stickney as Banquo. Joining them are actors from The Old Globe and Univ. of San Diego Shiley Graduate Theatre Program, including Amara James Aja as Bloody Captain and Menteith; Amy Blackman as 2nd Witch; Ally Carey as Lady Macduff; Ajinkya Desai as Fleance; Talley Beth Gale as Gentlewoman; Kevin Hafso-Koppman as Donalbain; Lorenzo Landini as Young Siward; Jake Millgard as Angus; Makha Mthembu as 1st Witch; Christina A. Okolo as Ensemble; Suzelle Palacios as 3rd Witch; Daniel Petzold as Malcolm; and Nathan Whitmer as Doctor. INSIGHTS SEMINAR: Tues, June 21 at 6:30 pm, featuring a panel selected from the artistic company of the current show, preceded by a reception at 6:00 pm. POST-SHOW FORUMS: Tues, June 28 & July 5, and Wed, June 29, where you may discuss the play with members of the cast and crew following the performance. SHAKESPEARE IN THE GARDEN: Tues, June 28; Wed, June 29; Thurs, June 30; Fri, July 1; Sat, July 2; all at 7:00 pm. This is a series of informal presentations in the Craig Noel Garden that enhance the theatre-going experience. Following Macbeth, the Summer Shakespeare Festival will conclude with Love’s Labor’s Lost, directed by three-time Tony Award winner Kathleen Marshall, Aug 14 – Sept 18. Also, from June 4 to July 7, the Globe, in partnership with the San Diego Public Library, will be the California host for First Folio! The Book that Gave Us Shakespeare, on tour from the Folger Shakespeare Library, one of the world’s most treasured books. Published in 1623, this famous volume is the first collected edition of Shakespeare’s 36 plays, half of which would have been lost if not for its publication. The Folger Shakespeare Library, in partnership with Cincinnati Museum Center and the American Library Association, is touring a First Folio across the nation, visiting one location in each of the 50 states, Washington, DC, and Puerto Rico. The volume will be on view in the Art Gallery at the San Diego Central Library @ Joan Λ Irwin Jacobs Common. During the entire month, the Globe, the Library, and their project partners will offer numerous public programs for adults and families before, during, and after the tour visits San Diego. For more information visit First Folio San Diego 2016. Previous Dr. Dianne G. Van Hook inducted into the Court of the Lord Chamberlain Next Send the Kids to A Noise Within’s Summer with Shakespeare Camp!